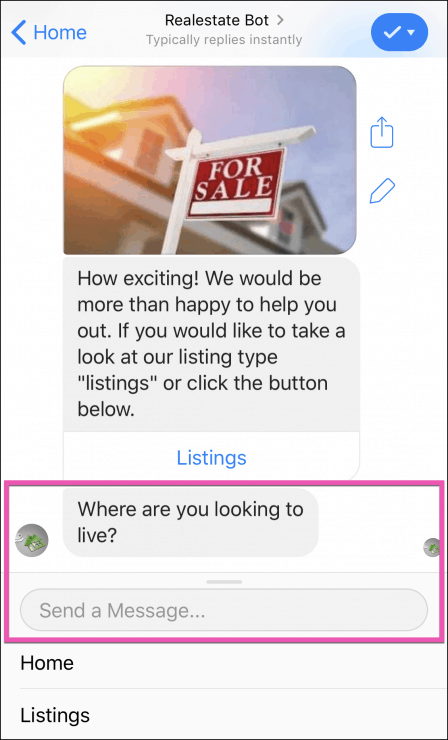 Here are 13 chatbots examples to replicate for maximum engagement and marketing growth. Chat blasting is a surefire way to generate a 70-80% engagement rate. Essentially, chat blasting is mass-messaging a broadcast to all of your contacts on Facebook Messenger. You can either send messages in real time or schedule them in advance like an email campaign, too. This was a great opportunity for us to provide insider knowledge to our contacts to keep them in the know about industry news and demonstrate our value. Check out the chat blast bot for yourself here. It’s no secret that people love being inspired and learning new things daily. It’s why those inspirational Instagram accounts exist, right? But you can’t go posting those quotes on Instagram and Facebook and expect big sales. It’s too crowded and overdone. Plus, it doesn’t really ensure that those who engage are interested in your products or services. Even LinkedIn is getting too saturated for it. Instead, deliver tidbits of information to your subscribers every day using chatbots. Share content directly with interested users rather than random Instagram users who haven’t connected with you. It can be in the form of tips, quotes, inspiration, or anything that helps you build loyal followers who look forward to your daily content. 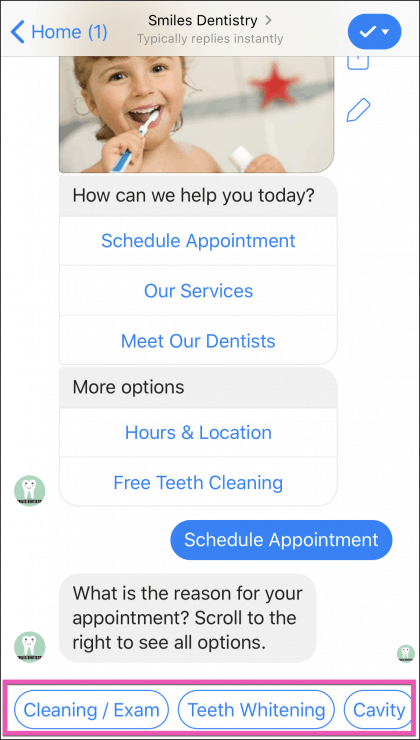 By setting up this scheduled chatbot with two button-based responses, we got people to opt in from ads and our website to our bite-sized inspiration. Want to check out the chatbot and experience it? Find it here. Now you can message them again with chat-blasting techniques to re-engage them and turn them into qualified leads. Building engagement is the first step in landing customers that grow your business. Instead of basic approaches, try something engaging and fun like an automated quote or marketing tip that provides value. Surveys are the lifeblood of improving your brand. Whether you need feedback from customers on your product or simply their thoughts on new ideas, surveys can win the day with free information from valuable sources. But getting your customers to actually engage with them is like finding a needle in a haystack. Most of the time, the issue with getting customers to fill out a survey is related to the platform. Emails get an average of around 15% open rates. But that’s just the rate at which people open the email. The likelihood of them taking ten minutes out of their day to answer a boring Google Surveys doc are slim to none. They have hundreds of emails to answer daily at work alone, not including promotions or boring surveys. Stop using email to reach them. That only generates donkey results. Ten responses to your survey aren’t statistically significant. I’ve done this countless times for multiple scenarios. 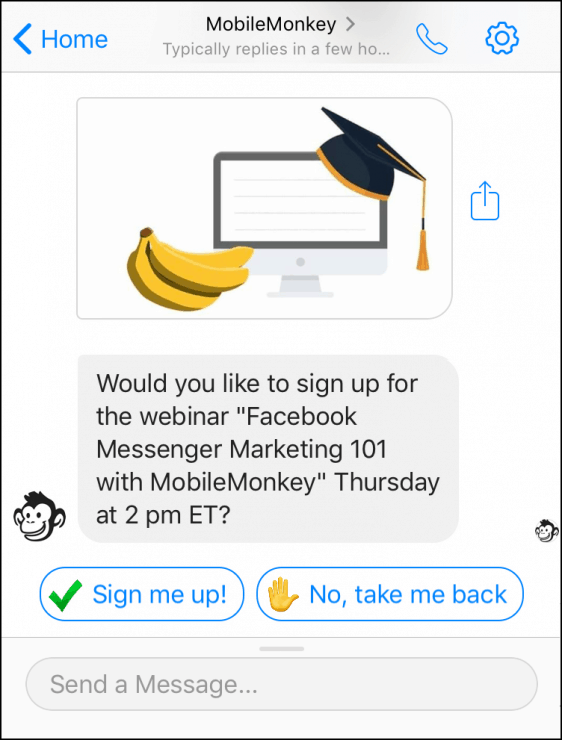 The example chatbot above is a survey I developed to understand how people found MobileMonkey and what interested them the most on Facebook marketing. Want to test the survey bot for yourself? Check it out here. Surveys on email take far too long to complete. Plus, they’re almost always not optimized for mobile. And the worst of all is that email surveys are anonymous. This means that if you serve multiple target markets, you are getting a mixed bag of data or you need multiple surveys to segment answers. On the MobileMonkey platform, you can drag and drop to build a chatbot in just a few minutes using the “Quick questions” feature. Create a new survey chatbot and chat blast your customers or contact list to get instant results. Getting qualified users to opt into just about anything online these days is tricky. Some people try to use deceiving language or clickbait offers. Some even game the system. But all that does is create tons of users who won’t respond to your future content or will likely unsubscribe quickly. Be honest about what users are signing up for. While that may bring down your total opt-in numbers at first, your conversion rate will thank you down the line because you’re weeding out contacts that weren’t going to stick around for the long haul. 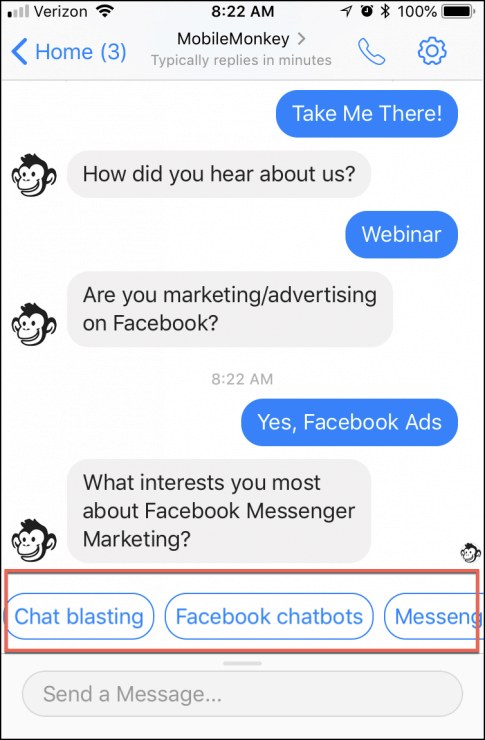 This example chatbot opt-in page is a tactic we use when chat blasting. Following chat blasting best practices by designing an opt-in page helps you avoid any troubles with Facebook, too. Try using a simple opt-in with a succinct message about what customers are getting by signing up. If you want, you can only include a “Yes, sign me up!” button. 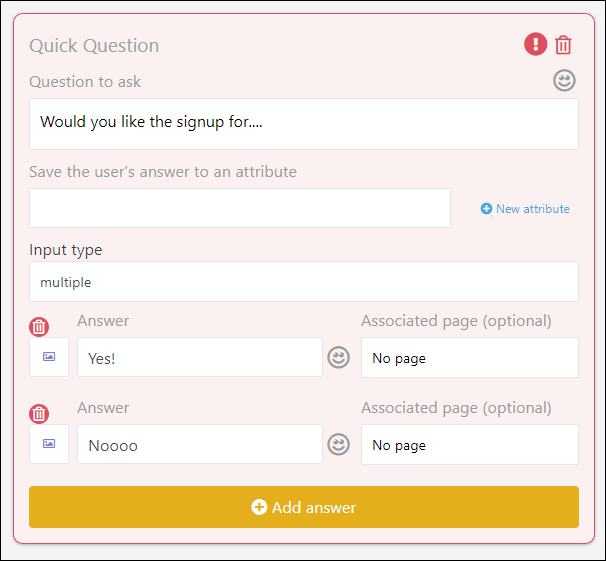 If users don’t hit yes, they simply aren’t signing up but can come back to the message later. After you create your new bot, you can utilize it as a checkbox CTA on your site. Drip campaigns are some of the best ways to engage customers throughout the buyer’s journey. They wait too long to follow up / they space out messages too far. Drip campaigns are slow when it comes to email. Wait five days, then respond. If they didn’t open it, send another message next Monday. By then, another company already engaged that lead, and they’ve bought a competitor’s product. You can’t wait that long. Natural, real conversations happen quickly in real-time, not over weeks with scattered emails and forgotten steps. Check out for yourself this drip campaign bot I set up. Depending on which option users select, they get segmented into two different audiences that experience different offers down the drip campaign. You can use the same strategy as this chatbot example to build drips just like you do on email. You’re able to schedule and segment by audiences and receptiveness. Ready to build your own drip campaign on MobileMonkey? Here’s how. One major criticism of chatbots for Messenger is the lack of personalization. The lack of a human touch that you can see on email or other contact methods. But that couldn’t be further from the truth. Bots can actually personalize better than automated emails. In MobileMonkey, you can quickly select dynamic parameters like first name, last name, time zone, and more. Test out our personalized chatbot example here. Use this to personalize chatbot messages just like your email campaigns. Once customers have engaged with these different parameters, you can actually segment them into new audiences, too. 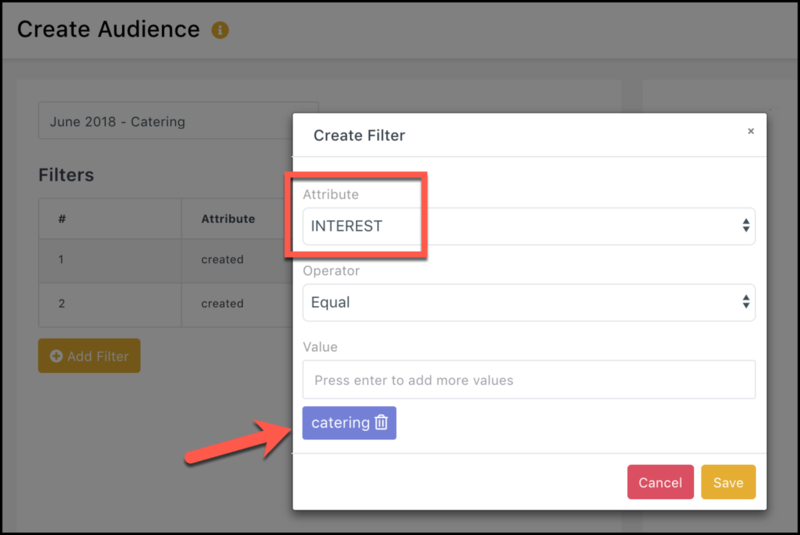 In the audience manager of MobileMonkey, use filters to create new segments to personalize more than just parameters. With audiences, you can select which groups get specific messages and content for deeper personalization. Email newsletters are everywhere these days. If you click on a blog post on any given topic, the chances of seeing a newsletter CTA on the sidebar are astoundingly high. 2.5% or less in most cases. That’s not good for growing a business. But where else can you share content? Your latest blog post? Ebooks? Funny GIFs and elements to help build your brand image? 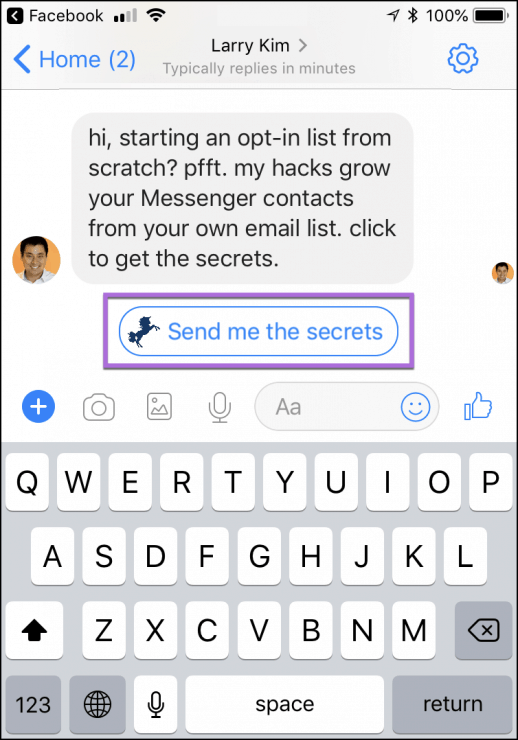 The better option: Use chatbots in Messenger. 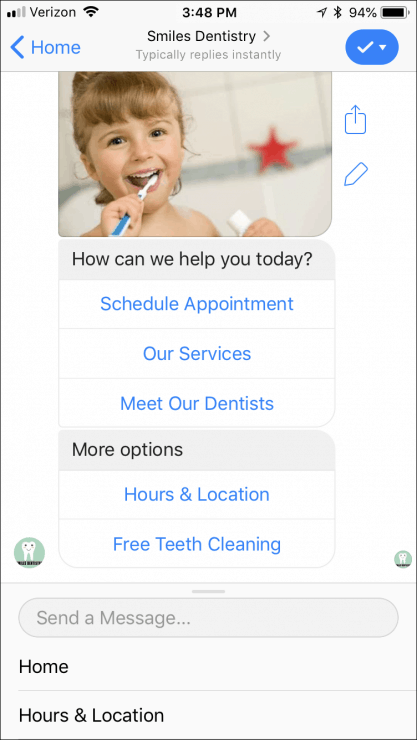 On MobileMonkey, you can quickly add new widgets to a chatbot without ever touching a code. Things like PDFs, text, images, native video, GIFs, and more! Try my content sharing example bot for yourself. Did you recently create an eBook that you want to share like a newsletter? Simply attach your PDF, and users can open it directly in their Messenger app without ever having to leave or download it. Now chat blast your contact list or schedule a chat blast in advance to deliver newsletter content weekly, bi-weekly, or monthly directly in Messenger. That’s integration that makes viewing and consuming content easy on desktop and mobile, which ensures that your audience won’t it ignore it like a typical newsletter email. Posting content on Facebook organically is still a great practice for most marketers. Want to get more eyes on your content? Likes, shares, and engagement? But typical posting strategies don’t generate that much engagement. The key here is to focus less on content promotion and more on virality. Content that engages users on social networks is rarely boring or cookie-cutter blogging content. So, why do I do this? 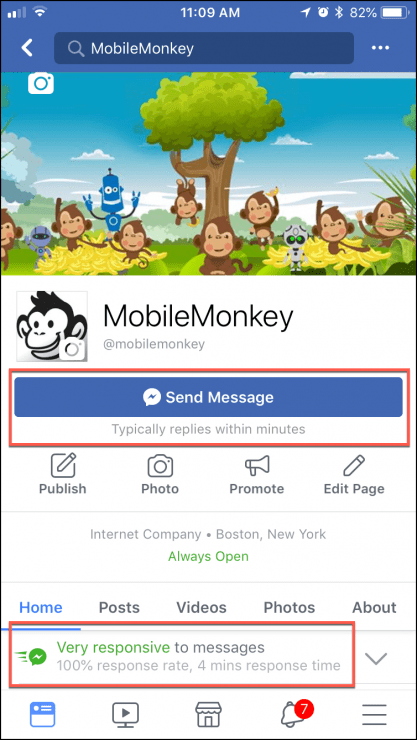 Because by using MobileMonkey’s comment guard — what we call a Facebook post autoresponder — I am capturing new contacts every time someone comments on the post. And these types of posts are comment magnets! 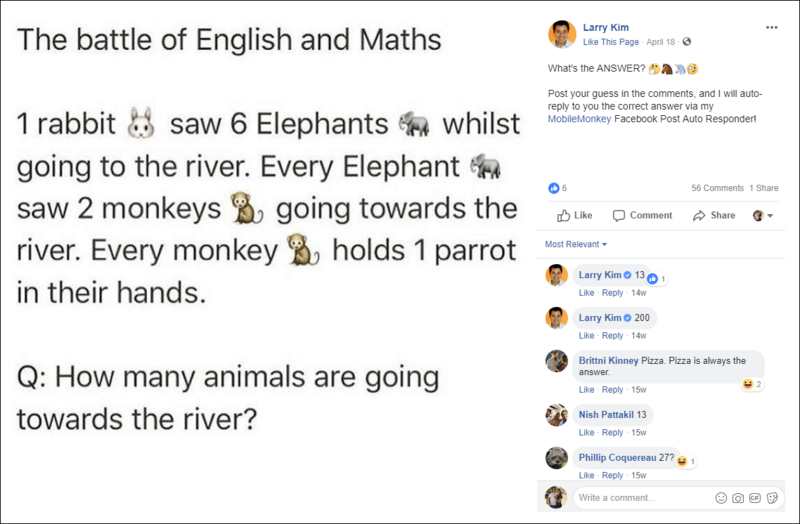 When someone comments on this post, they automatically get a response in Messenger from my bot. Test it out for yourself here! 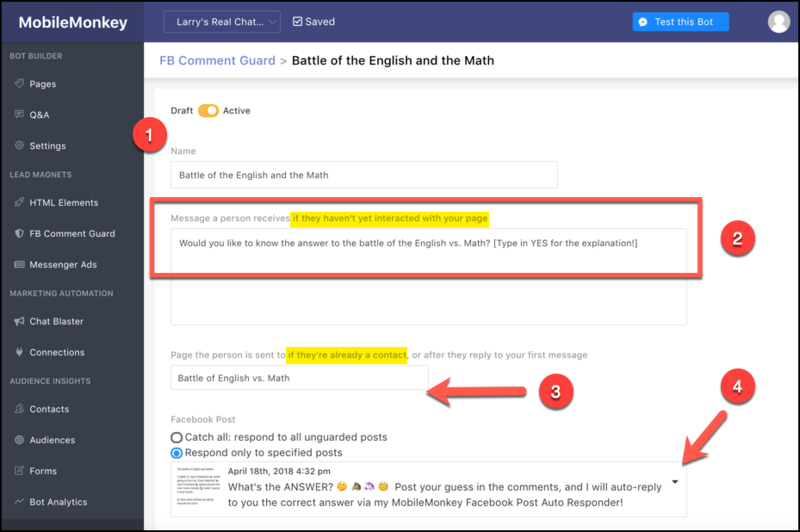 In four quick steps, you can set up a comment guard to engage brand-new users who haven’t engaged with your page as well as existing contacts. You can deliver segmented messaging to them. Set up a new comment guard. Enter the message that you want new users to receive when they comment. Enter the message that existing contacts will see if they engage. Select the Facebook post you want to use this for. Since the bot responds instantly, your response rate skyrockets, and your response times drop dramatically compared to human interactions. And response rates are key for keeping prospects around. Want to grow your business with chatbots? Use the comment guard feature to drive more opt-ins and build up viral engagement that you can capitalize on. Exclusive content is a great way to drive more leads for your business. Think about high-quality content like a long-form eBook, guide, or cheat sheet. 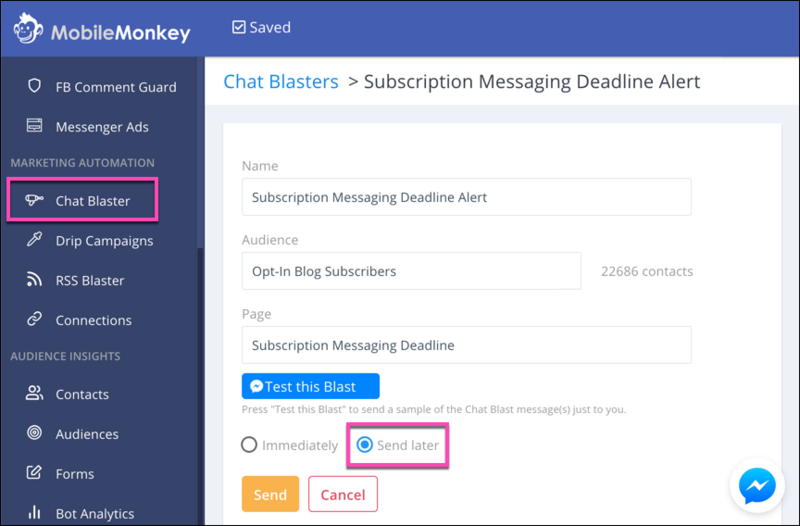 One of my favorite tactics with MobileMonkey is to use bots and chat blast lead magnet content that is only for insiders. Here’s how this chatbot example works. Giving only one option to respond with helps convert more users than giving yes and no options. Secondly, once users have opted in, you can deliver the goods directly on Messenger with widgets or take them off Messenger and back to your site. This exclusive offer feels much more personalized than sending emails with content pieces. Try it yourself on my bot here. In the beginning stages of MobileMonkey, we got some serious complaints because we were new to chat blasting and our contacts didn’t know that they could opt out whenever they wanted to. Sending drip campaigns with tons of content while lacking a clear opt-out option was trouble. We almost got banned from Facebook Messenger! Yikes. Thankfully, by just including a few opt-out messages, we solved the problem. Check out the unsubscribe message I use with my bots here. So, how does this help you grow your business when you’re eliminating potential leads? It saves you time and money in the long run. Imagine tracking, nurturing, and warming up a lead only to figure out that they didn’t really want to buy in the first place. That’s a huge waste of time and resources that will cut into your profit. Allowing users to opt out helps clear out leads that won’t be around later in the funnel and ensures that your bots can continue to message people without penalties. Let users know that they can opt out / unsubscribe whenever they want to. Include these messages every few days and as a reminder during drip campaigns. Lead qualification is generally a boring process. Maybe you’ve seen it in online forms for lead magnet content or have given information to a sales rep on the phone. But these methods are boring and saturated. 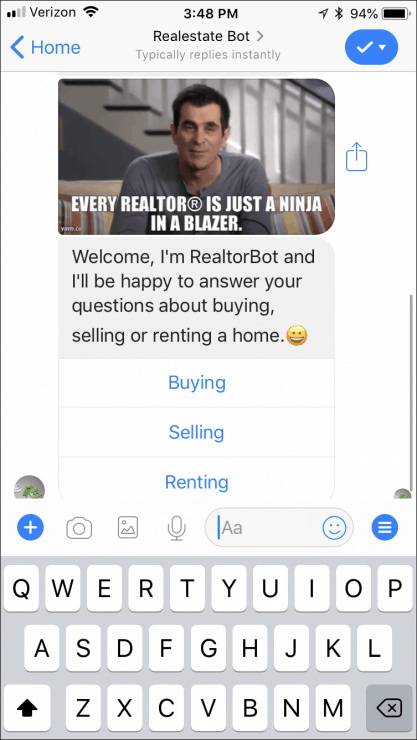 Let me show you a chatbot example for a real estate agent. Test out this bot on your own. Click here to see the process in action! Building a bot like this can save your company countless hours of manually qualifying leads. Experience a webinar registration chatbot for yourself here. You can customize them for practically any stage of the funnel, which makes them a versatile conversion tool. Via email, it’s often hard to get people to sign up. Open rates are mediocre, and click-throughs are even worse. But chatbot messaging has much better open and response rates. One unicorn tactic with webinars is to set up a chatbot that drives sign-ups for your webinar. Once users sign up, you can drip reminders to your webinar and ensure that you maximize the number of attendees from sign-up to live experience. Click here for the step-by-step guide to setting up this chatbot for your own webinars. When most people run ads on Facebook, they select typical objectives like engagement or traffic. While they can accomplish those goals, marketers have overused them. Just about every ad you see on a given Facebook News Feed is using those objectives. 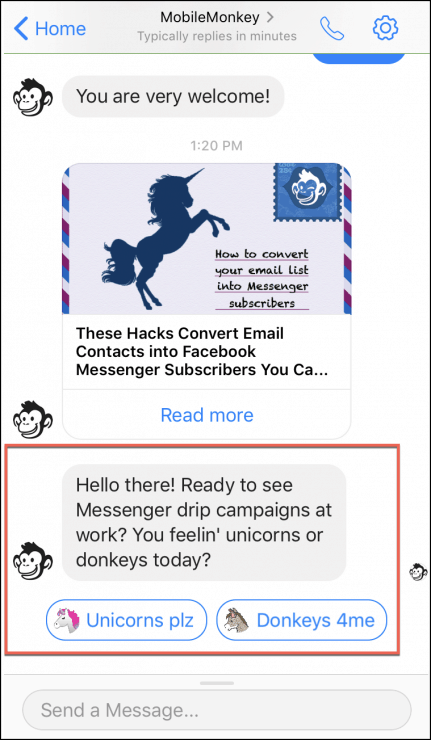 One strategy that we’ve used at MobileMonkey for unparalleled success is creating click-to-Messenger ads that direct users to a chatbot and turn every conversation into a lead you can follow up with. Click here to see what this ad looks like in your newsfeed (and what happens when you click it). 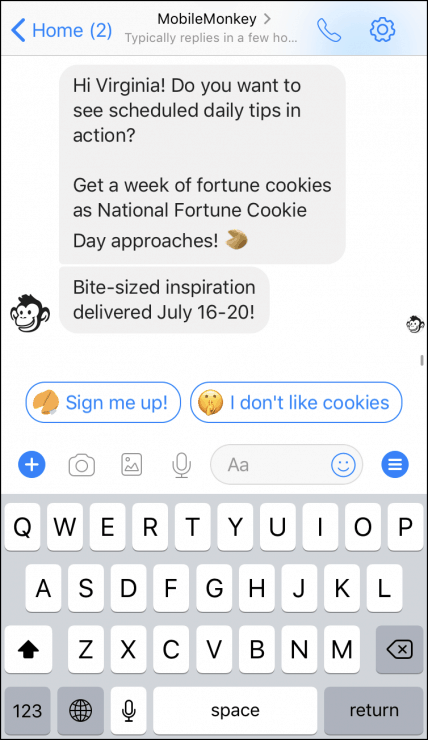 Combining both Facebook Ads and chatbots is one of the best ways to grow your contact list. 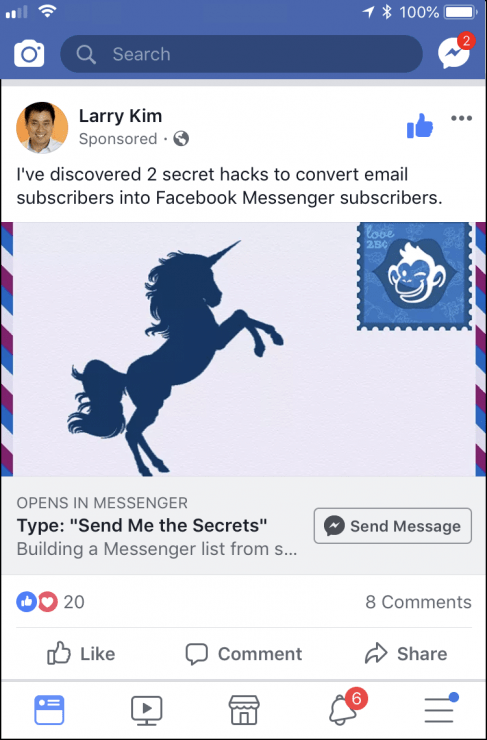 Reaching new audiences is easy, and having them opt into Messenger bots is much easier than having them fill out a landing page form that could contain wrong information. Want to set up this Click-To-Messenger chatbot? Follow our guide here. It’s no secret that email lists and contacts are great ways to grow your business. But reaching prospects and actually engaging with them is hard work. As organic reach declines on the platform, building an audience by posting organically is getting more and more difficult. So, what’s next to grow your business? They are exploding in popularity, and they give marketers a conversational way to interact with customers without staffing dozens of people to chat all day. 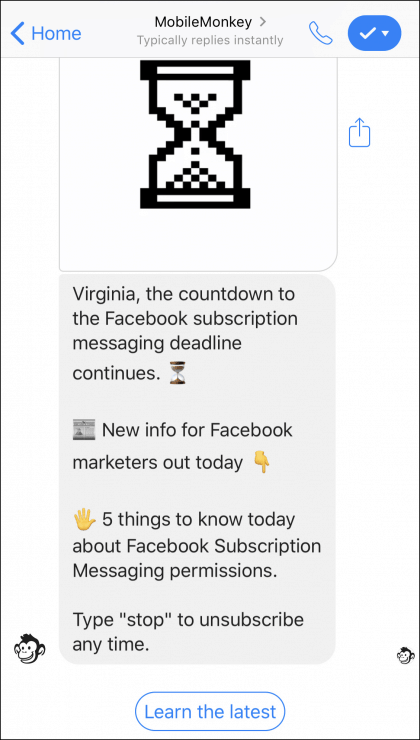 Follow these 13 different bot examples to start growing your business through surveys, personalization, drip campaigns, and more — all without lifting a finger. 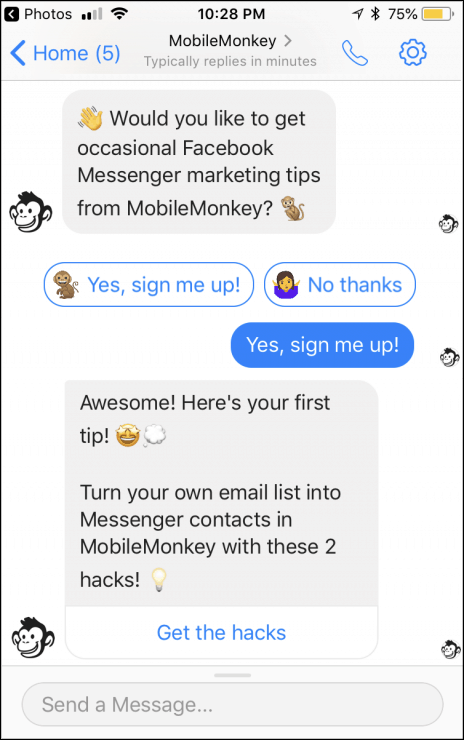 Sign up for a free MobileMonkey account to build your own chatbot using these effective examples. © 2019 MobileMonkey Inc. All Rights Reserved.